Pick’em8 – A fun, fast & strategic game! We're pleased to introduce our exciting new game, Pick'em8, An enjoyable game with no direct opponents, it's a great chance to multiply your bet in just a few minutes! It's easy to get the hang of and super-fast. A new round starts at least every few minutes, so players can jump in pretty much whenever they want. It’s a fantastic game if you want some high-speed action or simply a fun way to pass a few minutes while waiting for your next poker tournament to start. Check out the games Click on the Pick’em tab to see a list of all upcoming Pick'em games along with the buy-in amount and current prize pool for each table. 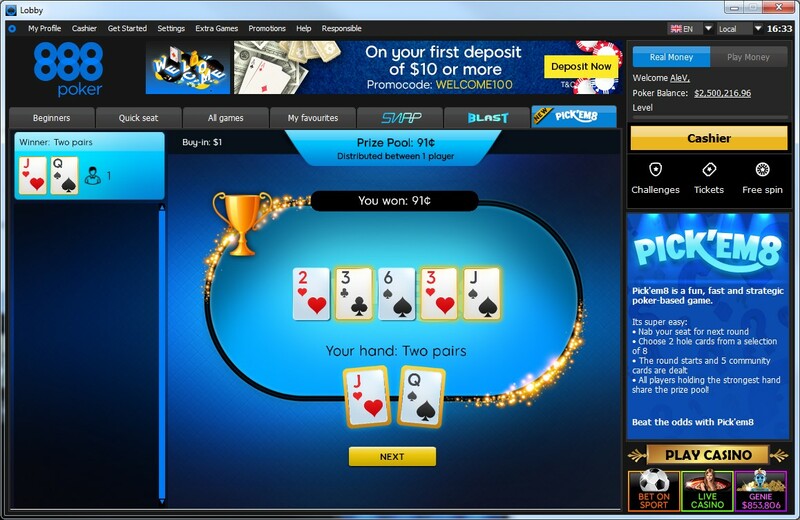 The prize pool is displayed with real-time updates – the more people join the table, the bigger the prize pool will be! Click on the game of your choice and then on the 'Join' button. Confirm your registration and buy-in, then get ready for the game to start! Players are presented with a selection of eight cards from which each player must choose two cards as their hole cards. Click on the “PICK’EM” button to confirm and 'lock' the selection. 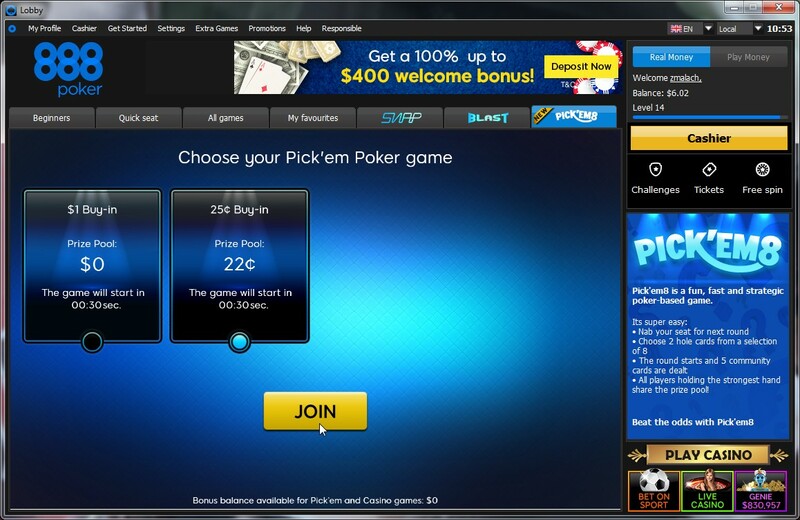 (If the player has not yet locked two cards by the time the game starts, the system will automatically use the two selected cards once the game begins. If they have not selected any cards, the system will select two hole cards for the player). Once the round starts five community cards are revealed. These cards are combined with the two selected hole cards to complete a standard Texas Hold’em Poker hand. Hand strengths are determined by Texas Hold’em Poker rules. The prize pool is divided between all the holders of the strongest hand. 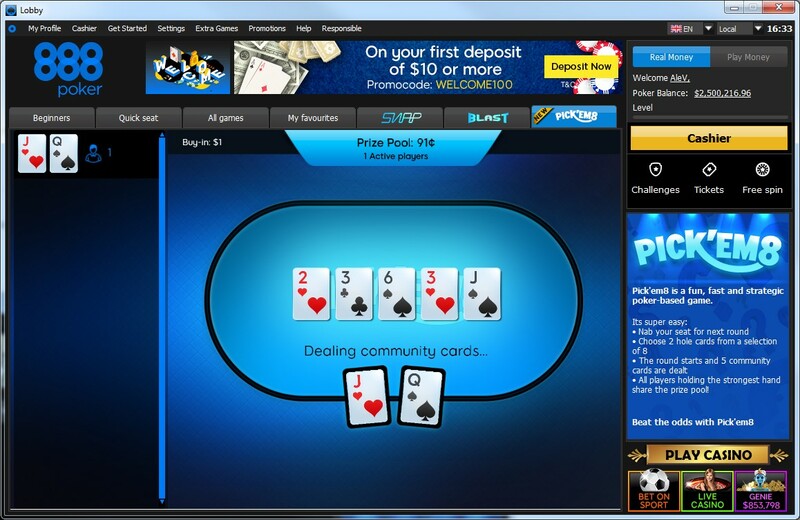 Players with a winning hand are alerted almost immediately after the community cards are dealt. That's it! 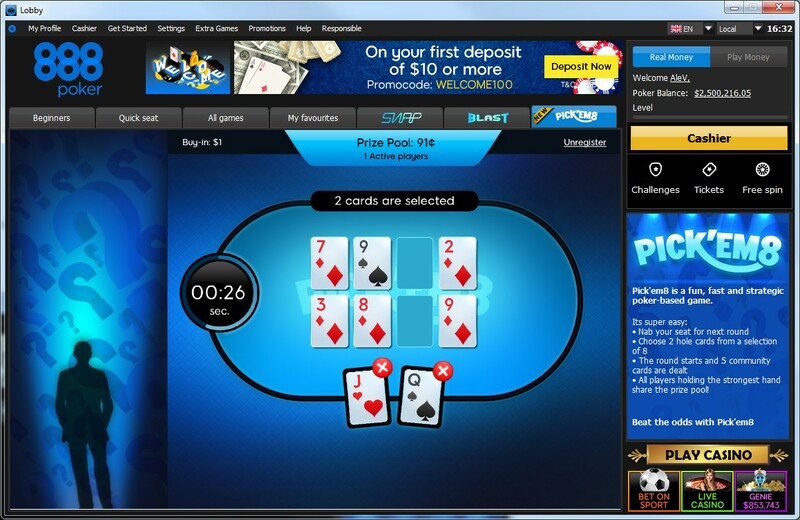 Play several rounds to see how quickly you could beat the odds and boost your bankroll. At the end of each round, players can click to continue, or return to the casino lobby. For the official Pick'em8 rules to the game, including all terms and conditions, please click here.